I’ve never seen the original canvas of Clément Berini. I have no reference as to the size and technique? 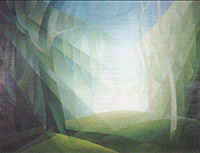 The pictorial work is a forest with a clearing. It is a serene composition with a hint of mysticism. Berini applies cubism to nature. The painting could have been used as a backdrop in trompe l’oeil on a theater set. The topic does not interest me, but his mastery of color gradients cause my curiosity. It is obvious that Berini mastered the technique of glazing. I imported a bitmap copy of the work in a vector drawing program that I modified. I documented the stages of production. The task proved to be repetitive and tedious, yet it allowed me to better appreciate the work of colorist Berini.